The cultural resource management realm is a strangely siloed one, where historians, biologists, archeologists, landscape architects, and other professionals cross paths but don't necessarily work together over time, something that probably contributes in an indirect way to the struggle that many historic sites have in building close relationships with working farms. We all have our specialized languages and methods, and although we're often talking about the same things, we don't often talk with each other, let alone with people who may actually be working and using the land we're studying. Movement is often centripetal, continually focusing our attention inward to our own disciplines and professions rather than outward in more expansive and inclusive ways. I was particularly struck by this on Wednesday, when I viewed the presentations from a landscape architecture studio led by Ethan Carr (left), a professor in the Landscape Architecture and Regional Planning department at the University of Massachusetts at Amherst. Ethan's students have been working on new design ideas for Martin Van Buren National Historic Site, on which my recent Ethnographic Landscape Study (about to be released imminently, I hope!) was focused. 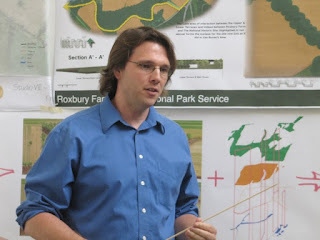 The students' plans centered largely (although not entirely) around agriculture, particularly on the need for structures, paths, views, and interpretive facilities that will enable the park to tell a broader story about farming at this site, perhaps in partnership with Roxbury Farm, the large CSA farm now cultivating the fields. Like me, Ethan's students benefited from the unusually cohesive body of existing scholarship commissioned by this park, particularly the two previous cultural landscape reports. Unlike me, though, they had only a very short time--a single semester--to get to know the site. Based on what they were able to glean from a handful of site visits and some familiarity with the earlier studies, they produced proposals for various ways to re-narrativize the landscape and enable visitors to come into closer physical and interpretive contact with past and present farming here. I took two main ideas away from the presentations. First, I realized how little I actually know about the vocabulary and methods of landscape architecture. Although cultural anthropologists like me supposedly share a core concern--culture--with those who study and design cultural landscapes, our approaches are miles apart. Their focus on "contributing features," views, and entry/exit points is as foreign to me as my interest in the politics of class and ethnicity may be to them. I know intellectually that professional disciplines often end up talking past one another like this, but it's different to see it actually happening in the case of a site where you've done intensive study yourself! And second, I realized that despite the obvious limitations of this kind of student project, there was still some possibility for ideas that push the conversation outward rather than circling it in on itself. The strongest proposals were the ones that acknowledged the gaps in the planners' own knowledge and left physical and conceptual room to fill in some of those gaps with on-the-ground encounters and experiences. Some of the students had rushed to propose what the farm could grow and where, and how they might market it, ignoring the very specific type of growing and selling that already happens here and the kind of long-term familiarity with land and community represented by this mode of farming. In a sense, they were replicating the hubris of industrial agriculture, which approaches land as a kind of blank page onto which growers can write whatever they want. The subtler plans left a different kind of blank space--a dialogic one that made room for visitors to ponder the existing farm operations in a more open-ended way. The most effective designs made room for the kind of looking and listening that might--for attentive visitors--foster greater depth of awareness and understanding of what was around them in both space and time. Perhaps not surprisingly, it was the simplest proposals that looked as though they would do that best--a classic case of "less is more." I'm getting ready for my annual pilgrimage to the National Council on Public History conference in a couple of days, and this reminds me that I've been meaning to write a post about another recent conference I participated in, the New England regional meeting of the Association for Living History, Farm and Agricultural Museums (ALFHAM), which was held in Bristol, Rhode Island early last month. The usual goal with a conference panel is to create something that fits together cohesively--a set of complementary papers or presentations, often capped off with some unifying comments by a discussant. In practice, what this often means is that panels get put together by fairly similar people who approach things in a fairly similar way. Over the years, I can count on the fingers of one hand the number of conference panels I've been to that successfully brought together different kinds of voices within the same framework--for example, scholars and labor organizers, or literary and academic writers. That more "multivocal" kind of panel--which doesn't always work neatly but which has the potential to "break the frame" of more inward-looking combinations of people and ideas--was what my co-organizer and I were after with our offering at ALFHAM. ALFHAM, founded in 1970 to coordinate efforts and education within the then-new living history movement, is an obvious starting-place for anyone who's interested in the nexus of farming and historic sites. I'd been vaguely planning to try to connect in some way with people involved in the organization, and found the impetus I'd been looking for when Michelle Moon, Assistant Director of Education for Adult Programs at the Peabody Essex Museum in Salem, Mass., got in touch with me after hearing me speak at a conference at Plimoth Plantation in the fall. Michelle is active in the Slow Food movement and has worked to link her museum work with food activism at the Peabody Essex, Strawbery Banke Museum in New Hampshire, and elsewhere. Like me, she's been looking for ways to make the food/history link more explicit and to make a case for the importance of historic preservation and interpretation in creating broader, more informed and critical public analyses of food systems and all that connect to them. 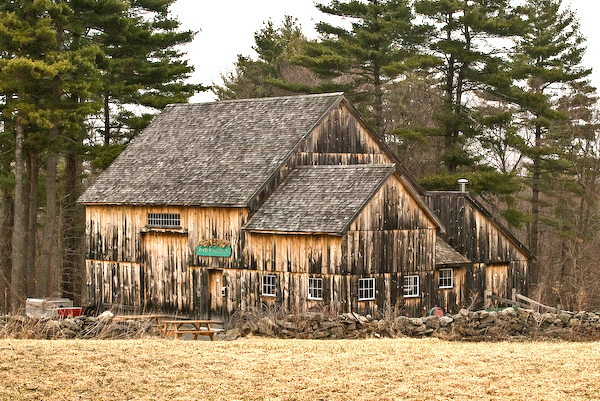 The c.1840 barn located at Waters Farm, Sutton, Mass. So Michelle and I put together a panel for the regional ALFHAM conference, aiming for a very specific mix of scholarship, case studies, and practical advice. 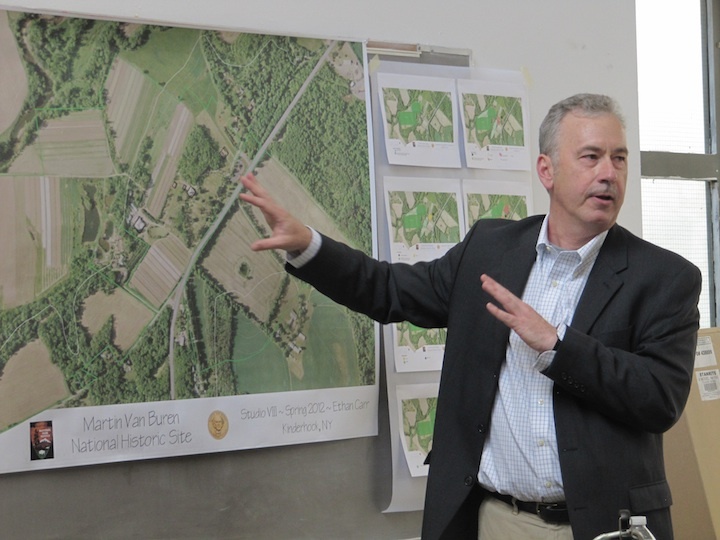 We enlisted a couple of people involved in food and farming at historic sites in the Blackstone River Valley National Heritage Corridor in southeastern Mass. and northern Rhode Island: Pat Nedoroscik, vice-president of Waters Farm Preservation Inc. the non profit organization charged with the operation of the 120 acre Waters Farm property in Sutton, Mass., and Lisa Mosczynski, who runs a seasonal farmers market at the E.N. 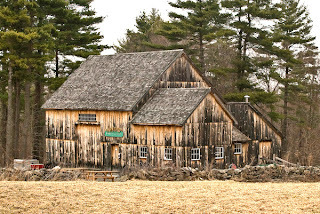 Jenckes Store Museum in Douglas, Mass. Yours truly supplied some scholarly/historical context for the emerging reconnection between "enclaved" historic sites and present-day working agriculture, Michelle talked about her rationale for emphasizing food and farming in many of the public programs she's organized, Pat gave us an overview of the family and farming history of Waters Farm, and Lisa got into the nitty-gritty of running a farmers market (including challenging us to name the most problematic product that farmers bring to sell*). These were four quite different approaches, but it was heartening to see how well they all fit together, and how the discussion that followed ranged from considering big historical questions to thinking about the practicalities of promoting locally-sourced food. I was really happy to see scholarship as just one piece of a broader conversation, rather than a privileged or separate discussion. Michelle's examples gave me hope that imaginative public history practitioners at museum sites can really take this local-food phenomenon and run with it, Pat's story of the Waters family confirmed the long history of community concern in New England with preserving agricultural land, and Lisa's account of dealing with boards of health and other issues provided an important corrective to more utopian or abstract dreams of how we might reinvent a more local or regional food system. The discussion wasn't conclusive or tidy, but despite that, or maybe because of that, it felt very productive (in addition to inspiring me to want to visit these historic sites sometime soon). Any similar experiences with multivocal conference panels? *And any ideas what the most challenging farmers market product might be? Post them below! I stole a little time away from work yesterday to put a few plants in the ground and continue getting my new garden infrastructure in place. The deer, the porcupine, and the neighor's marauding dog have all put in an appearance this week, and I'm feeling the need to get those fence-posts in very soon! But the time outside, while useful and therapeutic, put me even farther behind, because I'm in the throes of an over-busy spring of teaching, planning, and conference-going--which is to say, a pretty normal spring for anyone in the academic business. This puts me in mind of something I came to realize while I was doing my research a couple of summers ago in New York state: farmers’ and academics’ schedules are diametrically opposed, in ways that are either perfectly complementary or impossibly out of sync. This isn’t accidental, of course--our school year is still based on the old let-the-kids-out-to-work-on-the-farm-in-time-for-haying pattern. The majority of people in this part of the world were no longer farmers (or even rural) by 1920 or so, but the rhythm of the agricultural year still shapes our academic lives, even after all this time. What this means for academics who want to study agriculture is that the people you need to observe and talk to are at their very busiest during the months of the year when you actually have time to do your research. Many of my fieldwork interviews in Columbia County were done literally in a field—that is, in a farmer’s field. One dairy farmer excused herself in the middle of our interview to help her daughter-in-law chase the cows back into the barn, and one of my most useful and memorable encounters, with latter-day yeoman farmer Mike Scannell of Harrier Fields Farm, took place among his Red Devon cows, who live outside year-round and who were busy fertilizing the field for him the whole time we were talking. 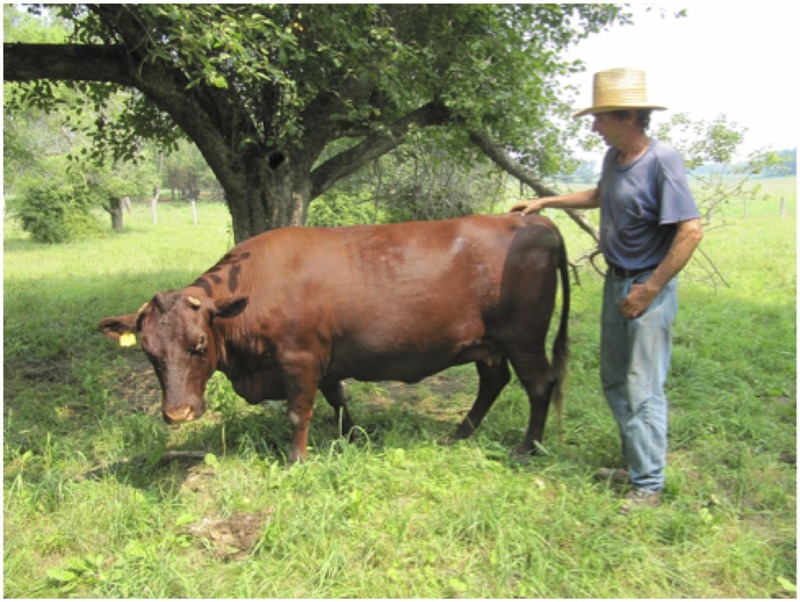 One of the reasons my interview with Mike was so useful was that he's a farmer who has read widely and thought very deeply about the history of American agriculture and the various dilemmas that small farms find themselves in today. When does he do all this reading? In the winter, of course--when life on the farm slows down and he has more time to reflect. It's another one of those natural-rhythm things that make sense in the context of an agricultural life. There's a time when you're crazy-busy, and then a time when you can actually catch your breath before it all starts up again. Lately I never seem to get out of the crazy-busy phase, and I hear the same thing from more and more of my fellow scholars (Sharon Leon at the Roy Rozenzweig Center for History and New Media wrote a good blog post about it earlier this week). Digital technology and the increasingly rushed and productivity-oriented pace of many areas of higher education, plus the fact that "contingent" knowledge workers like me usually have to juggle multiple overlapping jobs and schedules, means that there's no longer any naturally-occurring down-time for many of us. A lot of people are working on eating more seasonally these days, and it strikes me that it would be a good idea to figure out how to work more seasonally, too. That might mean gearing up during the growing season and then slowing down in the winter, or maybe it would be an academic schedule that actually did give us a chance to think and reflect and write during the summer. Or maybe (and this is my own perfect world) it would involve a nice syncopation of the two different but potentially complementary rhythms. Whatever the mix might be, I guess this particular season is always going to be busy. One of my farmer-interviewees in New York state told me, during a hectic 30-minute conversation in his barn, "On the first nice day of spring, a dairy farmer gets a week behind schedule; by the fifth nice day, he's two weeks behind." That's about where I am right now, madly prepping conference presentations and classes while trying to carve out a little time to put manure on the new garden beds and get the holes dug for the fence posts. It's all good, and I tell myself that there are far worse things than having too much work that you love. I hope that someday soon I'll have a chance to work on book-scale rather than blog-scale ideas again, and in the meantime, I'm just trying to do what the farmers do: to keep growing. Three Tough Questions, Part 3: How Political is Your Palate? A while back, I wrote a blog post elsewhere about how the presence of an organic food company's family history display on the side of a delivery truck turned an urban space into a kind of pop-up theme park. 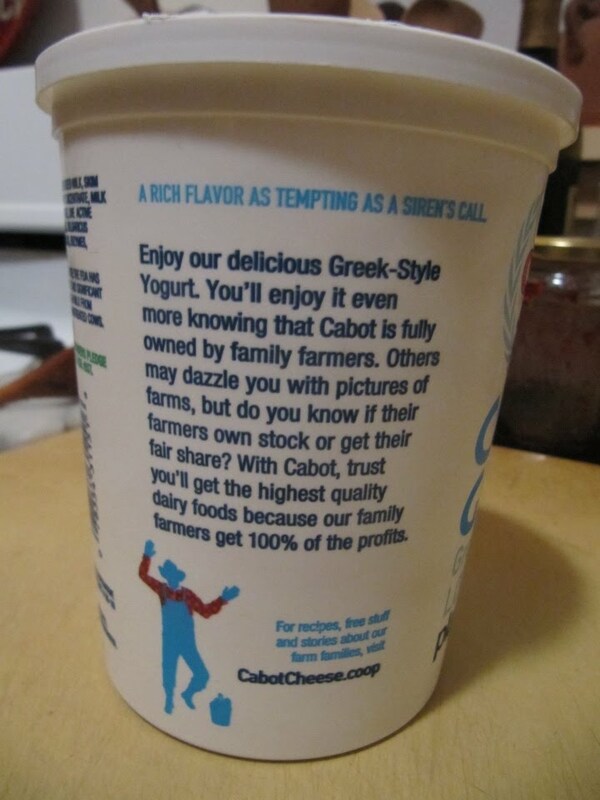 I was thinking about that the other morning when I focused my eyes clearly enough to read the text on the side of my Cabot yogurt container, which told me that I would enjoy my yogurt more knowing that the company was fully owned by family farmers. "Others may dazzle you with pictures of farms," the text went on, "but do you know if their farmers own stock or get their fair share?" This struck me as pretty hard-hitting, especially at 7 a.m. "Dazzle you with pictures of farms" was a direct jab at what Michael Pollan has called "supermarket pastoral'--the evocation of small-scale and artisanal food production in ways that may be at odds with how the food was actually grown or how it's being sold (most notably in an upscale healthfood supermarket chain whose name hardly needs mentioning). That's what I was seeing on the side of the delivery truck, and what increasingly turns up in marketing materials for products from apples to eggs to wine. 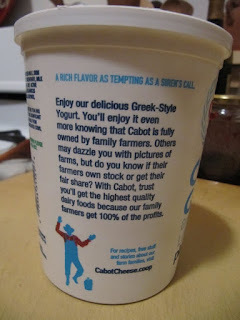 This strategy aims to make us feel good about our food by knowing something about where it came from, but what the Cabot container was telling me was that we shouldn't accept those claims at face value. It was asking me to be both critical and political first thing in the morning. I happen to be that way at all times of the day, to the occasional annoyance of my husband and others who have to listen to me. But I do have to wonder about what the most workable balance is between "feel-good" and "feel-bad" approaches to knowing about our food (or all the other things we consume). I was particularly thinking about that this week when Lisa Gross, founder of the Boston Tree Party, came to speak to one of my Tufts classes. 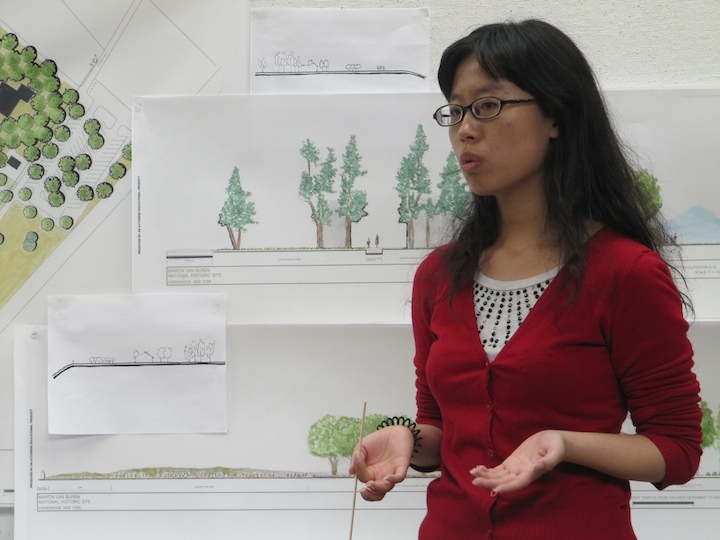 Lisa is a conceptual artist who conceived of this apple-tree-planting project--what she calls a "decentralized public urban orchard"--in 2010 as a combined greening, re-skilling, community-building, public art, and civic engagement effort. Lisa is terrific--warm, articulate, and very savvy about the layers of social, metaphorical, and environmental meanings that she and others have seen in the Tree Party. But while acknowledging that the name itself was a "cheeky" reference to a certain political movement with a similar moniker, she made it quite clear that the project is essentially apolitical. Her rationale echoed something I've frequently heard from other younger farmers and foodies: they're looking for ways to bring people together and make them feel better, not subject them to angst about everything that's wrong with the food system. 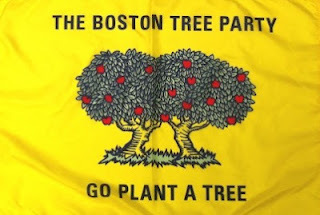 Lisa credits this positive approach with at least part of the unexpected success of the Tree Party--expecting a handful of groups to sign up, she's been amazed to find dozens and dozens of "delegations" planting and pledging to care for a pair of trees. And the list of participants is an impressively diverse slice of Boston-area civil society, suggesting that the apolitical character of the project may indeed make it more appealing for a wide range of people to sign on. It sometimes strikes me that younger activists like Lisa have grown up hearing so much doom and gloom about the melting, imploding, messed-up planet that they've consciously shifted away from fighting one exhausting battle after another. It's something I hear frequently from my students: they understand the critiques they're learning in school about everything that's wrong with the world, but they feel that just being critical doesn't leave them much of a platform for doing something with their lives. They make me wonder whether my own tendency to default to the political argument is kind of an old-leftie reflex (even though I'm a tad too young to be a card-carrying old leftie) and whether, in a food system where there are few choices that don't feel insufficient or compromised in some way, there's a certain wisdom in just letting go of the cynicism every now and again. I've been arguing for the importance of injecting a more critical/historical sensibility into the new food movement, but maybe it's just as crucial to know when to stop talking and just go plant something. What do you think? How political should we try to get over breakfast? 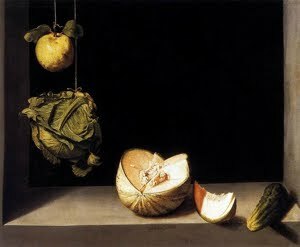 How do you balance the "feel-good" and the "feel-bad" sides of thinking about food?